Review Update: as of today (6/21) Following Atticus has made one the New York Times Best Seller Lists! I am not a wordsmith. After teaching K-12 art for thirty years, I can safely say visuals are more my style. I only write about books if they personally moved me. Following Atticus touched me. Atticus caught my eye at our school’s spring book fair. 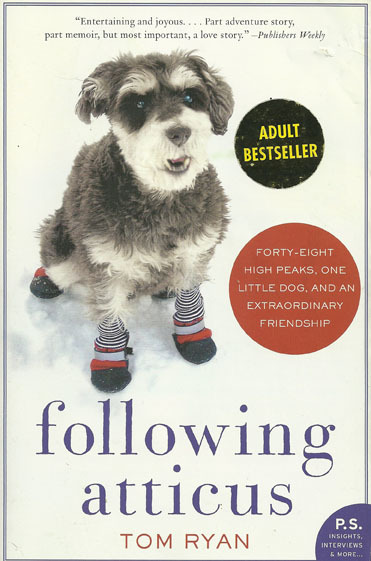 The little dog on the cover looked pretty snazzy in his red, white and black Muttluks. The back blurb described this overweight journalist who climbed all these mountains with this little guy. I like dogs (heck, we have six) and have rarely seen a mountain (been to the Rockies three times), so I thought I would give it a read. “Never judge a book by its cover,” they say. In this case, the book did not disappoint. This twenty-pound Schnauzer and best bud, Tom Ryan, mountain-climbed mostly during the winter. The mountains are mostly background ( for stories about love, friendship, redemption, forgiveness, letting go, becoming at peace with oneself, and following dreams. I probably missed something. And parts of this story will probably cause you to weep. Do I recommend this book? Yes, whole heartily. You can find it on Amazon but if you want to support independent bookshops, please go the White Birch Bookstore. If you want, Tom Ryan will sign your book. White Birch Book Store, Conway, NH. We are participating in two blog hops today, Thoughtless Thursday and Barks and Bytes. Check out the other blogger's link up down below.